Payton Doiron and Charlee Horton celebrate St. Joseph’s Class M championship. Catherine Avalone – Hearst CT Media. Forty-six stories. After a fast and furious few weeks, that is the final number of championship stories included in this Linked Up – Spring Championships 2018. As has become custom around here, this story has put those championship stories and memories all in one place for easy consumption to help celebrate these champions. For those unfamiliar (or simply as a reminder for those who are previously familiar) Linked Up Championships will provide a link to the local media story for all of the CIAC Championships over the course of the season.It provides a one-stop shop for anyone looking for great stories on championship-winning teams. For more championship information be sure to check out the CIAC Tournament Central page. And check back often for more championship stories here. From the Hartford Courant: It looked like Stafford was facing long odds in the Class S final, but the Bulldogs found a way to earn the program’s first title in more than four decades. From the Connecticut Post: St. Joseph believed its bats would come to life eventually, and they have the Class M title to prove they were right. From the Connecticut Post: The word of the day was perfection for Masuk which capped an unbeaten season with the Class L championship. From GameTimeCT: Continuing an offensive assault from its semifinal comeback, Amity came away with a title in Class LL. Staples completed an unbeaten season in a thrilling Class L final. Gregory Vasil – Hearst CT Media. 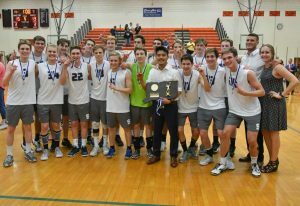 From the Bristol Press: In a battle of attrition, Newington held on for a five-set win to earn its second-straight Class M title. From the Norwalk Hour: Staples got the fast start it wanted in the decisive fifth set to win a thrilling Class L final. A celebratory pileup for New Fairfield concluded the Class M final. H John Voorhees III – Hearst Media CT.
From GameTimeCT: A pair of New Fairfield leaders made a long-time dream come true with the team’s Class M title. 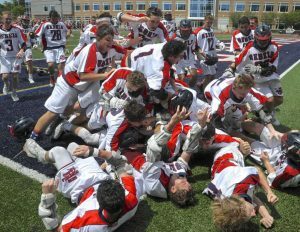 From TheRudenReport.com: Ridgefield’s victory in the Class L final may not have been pretty, but it was memorable for the Tigers. From the Trumbull Times: A year of growing pains behind them, St. Joseph used a third-quarter flurry to earn a Class S crown. New Canaan celebrates the team’s Class L championship. Dave Stewart – New Canaan Advertiser. 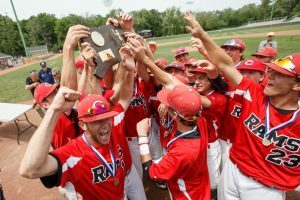 From GameTimeCT: In the kind of game you would expect between two rivals, Branford outlasted Daniel Hand to repeat as Class M champions. From the Danbury News Times: New Fairfield’s defense stood strong when it had to to help the Rebels earn the championship in Class S.
From the New Canaan Advertiser: The New Canaan seniors had a special conclusion to the season culminating in the Class L title victory. Cheshire holds aloft its Class LL championship plaque. Justin Weekes – Meriden Record Journal. From the Meriden Record Journal: Cheshire ended a 25-year drought in a tight 1-0 win to claim the Class LL crown. From the Waterbury Republican-American: Round two between Seymour and Wolcott was very different from round one with Seymour slugging its way to a Class M Championship. 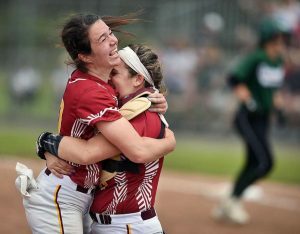 From the Connecticut Post: Notre Dame-Fairfield’s coach dreamed of a transformation, and it was capped with a Class S title for the Lancers. From the Hartford Courant: An offensive explosion propelled Wethersfield to the Class L Championship and the program’s first title. Killingly’s Dylan Deotte and his teammates captured the Division III title in a playoff. Aaron Flaum – Norwich Bulletin. 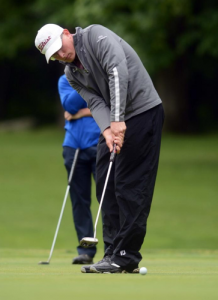 From the Middletown Press: A strong tee-to-green performance helped Xavier’s Chris Fosdick capture the inaugural CIAC Golf State Open. From the Collinsville Press: It was a coach’s dream come true for Avon to earn a second-consecutive Division II title. 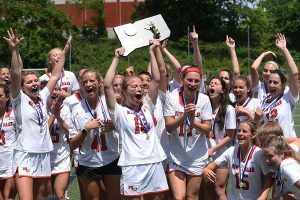 From the Greenwich Time: The New Canaan girls worked overtime to capture a second-straight state championship by the slimmest of margins. From the Norwich Bulletin: Killingly was anxious for the 3-hole playoff, but came through in the clutch to capture the Division III state title. From GameTimeCT: A total team effort carried Portland to a third-straight title in Division IV. From the Greenwich Time: A dour weather forecast didn’t dissuade or slow Greenwich from claiming the Division I championship. Kristin Butler and Hannah Bjorkman celebrate the pair’s State Open doubles crown. John Nash – Hearst CT Media. From the Norwalk Hour: In a match worthy of a a State Open, Kristin Butler and Hannah Bjorkman prevailed in a third-set tiebreak to claim the State Open doubles title. From The Day of New London: Gabby Dellacono may want to recreate her preparation for the State Open singles final because it worked very well as the Stonington junior earned the championship. 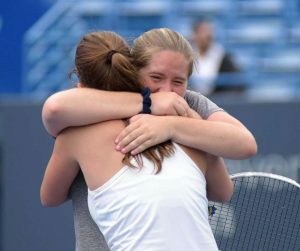 From the Aspetuck News: Mariel Zech’s win at third singles proved decisive as Weston earned the title in Class S.
From the Stamford Advocate: It came down to the final match before Staples prevailed against a rival to capture the Class L crown. From the Aspetuck News: It had been a long time since Joel Barlow added to its championship history but that ended with a title in Class M.
Daniel Hand bettered its runner-up effort a year ago with a win in Class L. Kelly Fryer – Shore Publishing. From theNorwalk Hour: Staples senior Evan Felcher ended his career with quite a statement by winning the State Open singles title. From the Norwalk Hour: Taishi Hosokawa wanted to continue a family tradition, and he and partner Prem Dave of Norwalk made it happen with a State Open doubles victory. 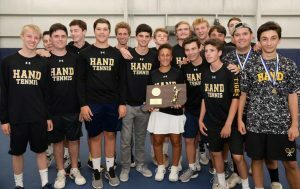 From Shore Publishing: Daniel Hand was determined to better runner-up finishes last season, and made good on its efforts with a title in Class L.
From the Waterbury Republican American: Strong runs in singles and doubles carried Litchfield to the Class S championship. From the Aspetuck News: Weston continued its dominance in Class M, capturing its fifth-straight title. From CIACsports.com: Runner-up performances in singles and doubles was enough to power Staples to the Class LL title. Danbury added to its program history with the State Open title. Sean Patrick Bowley – Hearst CT Media. From The Day of New London: A big-time performance on the second day earned Stonington’s Shane Smith the decathlon title. From the Danbury News Times: Danbury was happy to add to the program tradition with a State Open title. From GameTimeCT: Another Class S title for Derby has the athletes adding to an impressive legacy. From the Hartford Courant: Windham snapped a drought of more than 20 years by capturing the Class M title. From the Danbury News Times: Danbury put a final exclamation point on its Class LL title. 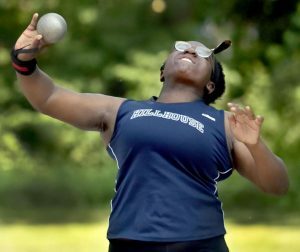 From GameTimeCT: Relay wins played a key role as Hillhouse captured the championship in Class MM. From the Hartford Courant: It came down to the final event, but Hall came away with the win in Class L.
A strong all-around performance powered Hillhouse to the title in Class M. Peter Hvizdak – Hearst CT Media. From the Norwich Bulletin: Griswold’s Kalli’Ana Botelho liked winning the heptathlon competition so much she did it for a second-straight year. 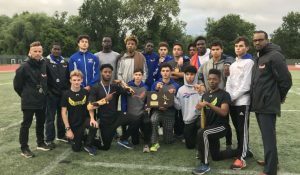 From the Hartford Courant: Southington was stellar in the “field” portion of track & field to claim the program’s first State Open crown. From the Danbury News Times: The Danbury girls helped the school to a meet sweep with a win in Class LL. From the Hartford Courant: The Windsor girls track team members push each other — in this case to another Class L title. From the Collinsville Press: The Avon girls didn’t necessarily know they had a shot at a title in Class MM, until they went out and won it. From the Hartford Courant: A record-setting performance was part of another strong all-around effort as Bloomfield claimed the Class S crown. From GameTimeCT: It was lucky #14 for Hillhouse as the girls earned the program’s 14th class title with a win in Class M.
CHESHIRE, Conn. – The CIAC Class L baseball semifinals on Wednesday, June 6 will be played at Dunkin’ Donuts park in Hartford. For fans attending the game, FREE parking will be available at the 300 Market Street Parking Lot in Hartford. There will be a fee at all other lots. Schedules for 2018 spring sports have been posted on the CIACsports.com site. To view a schedule for any school or specific team, or a statewide master varsity schedule for a sport, visit the main schedule and results page of the site, or the “Schedules/Results/Rankings” tab on the mainpage of any spring sport.